As it turns out, the forex markets are currently treating the Loonie and the Aussie as inseparable. 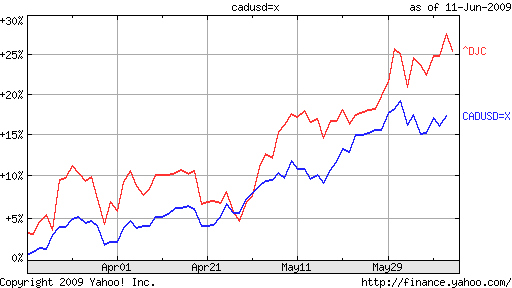 According to Mataf.net, the AUD/USD and CAD/USD are trading with a 92.5% correlation, the second highest in forex (behind only the CHFUSD and AUDUSD). The fact that the two have been numerically correlated (see chart below) for the better part of 2011 can also be discerned with a cursory glance at the charts above. Why is this the case? As it turns out, there are a handful of reasons. First of all, both have earned the dubious characterization of “commodity currency,” which basically means that a rise in commodity prices is matched by a proportionate appreciation in the Aussie and Loonie, relative to the US dollar. You can see from the chart above that the year-long commodities boom and sudden drop corresponded with similar movement in commodity currencies. 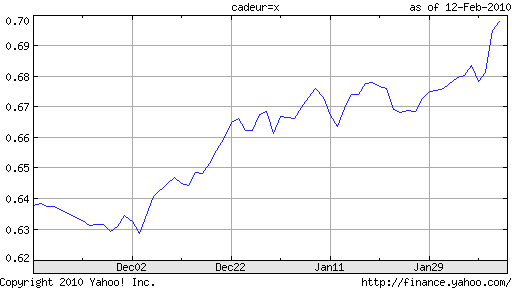 Likewise, yesterday’s rally coincided with the biggest one-day rise in the Canadian Dollar in the year-to-date. Beyond this, both currencies are seen as attractive proxies for risk. 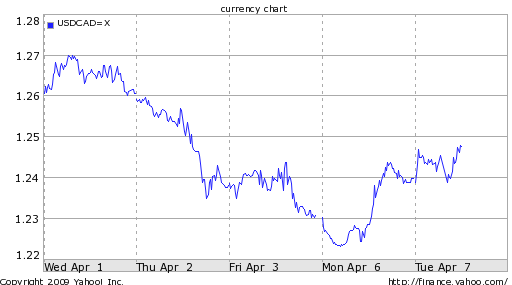 Even though the chaos in the eurozone has very little actual connection to the Loonie and Aussie (which are fiscally sound, geographically distinct, and economically insulated from the crisis), the two currencies have recently taken their cues from political developments in Greece, of all things. Given the heightened sensitivity to risk that has arisen both from the sovereign debt crisis and global economic slowdown, it’s no surprise that investors have responded cautiously by unwinding bets on the Canadian dollar. Finally, the Bank of Canada is in a very similar position to the Reserve Bank of Australia (RBA). Both central banks embarked on a cycle of monetary tightening in 2010, only to suspend rate hikes in 2011, due to uncertainty over near-term growth prospects. While GDP growth has indeed moderated in both countries, price inflation has not. In fact, the most recent reading of Canadian CPI was 3.7%, which is well above the BOC’s comfort zone. Further complicating the picture is the fact that the Loonie is near a record high, and the BOC remains wary of further stoking the fires of appreciation by making it more attractive to carry traders. In the near-term, then, the prospects for further appreciation are not good. 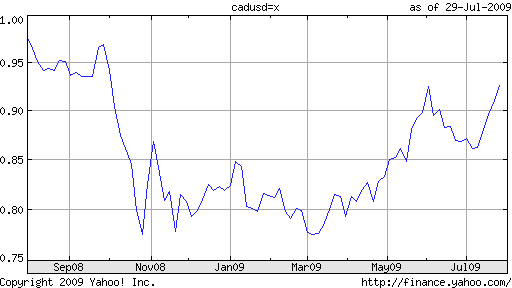 The currency’s rise was so solid in 2009-2010 that it now seems the forex markets may have gotten ahead of themselves. A pullback towards parity – and beyond – seems like the only realistic possibility. If/when the global economy stabilizes, central banks resume heightening, and risk appetite increases, you can be sure that the Loonie (and the Aussie) will pick up where they left off. In April, I wrote a post entitled, “Economic Theory Implies Canadian Dollar will Fall,” in which I argued that the currency’s impressive rise was belied by fundamentals. It seems the gods of forex read that post; since then, the Loonie has fallen 3% against the US dollar alone. Based on my reading of the tea leaves, the loonie will fall further over the coming months, and finish the year below parity. My contention is basically that investors are falsely treating the Loonie is a high-yield growth currency, and hence, bidding up its value. There are a few reasons why I believe this viewpoint is completely erroneous. First of all, Canada’s economy is both plain and mature. While it is indeed rich in natural resources would seem to make it stand-out, commodities exports account for only a small portion of GDP. Given that the US absorbs 75% of its exports, it’s no accident that Canada’s economic fortunes are tied closely to the US. Finally, Canadian interest rates are pretty mediocre, which means there is neither a strong monetary nor an economic impetus for buying the Loonie against the dollar. While Canadian GDP and inflation have exceeded analysts’ predictions, the consensus expectation is still for the Bank of Canada to hold off on tightening until September or so. Even the most bullish forecasts show a benchmark interest rate of only 1.75% by the end of 2011 and perhaps 3% at the end of 2012. In other words, it will be a long time before the Loonie becomes a viable target currency for the carry trade. According to OECD models, the Canadian dollar is overvalued by 17% against the Dollar on a purchasing power parity (ppp). While it is generally dubious to apply this concept to currency markets, I think it’s reasonable to invoke it when analyzing the USD/CAD. The two economies share more than just a border. As I said, their economies are closely intertwined, and goods, services (and people!) move freely between the two. Thus, you would expect that large discrepancies in prices should disappear over the medium-term. In fact, the Canadian trade balance recently slipped into deficit for the first time in 40 years (corresponding with the Loonie’s record high level), which shows just how quickly consumers can shift their attention south of the border. That means that either Canadian prices have to decline (something which retailers are always reluctant to effect) or the Loonie must drop further against the Dollar. 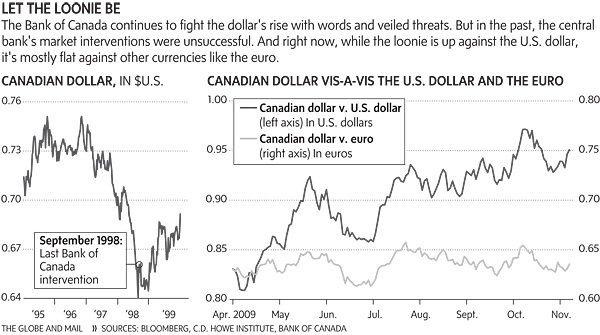 Of course, there is a mitigating factor: the US dollar may fall even faster than the loonie. While it would seem impossible to tease apart the loonie’s rise from the dollar’s fall (since a rise in CADUSD inherently reflects both), we can still make an educated guess. 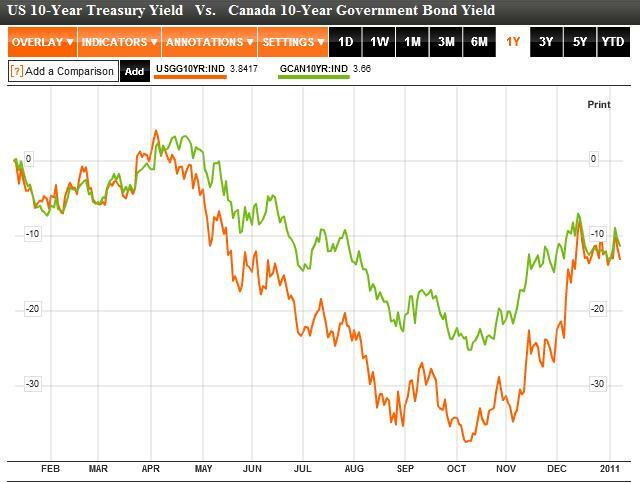 For example, consider that the Canadian dollar is strongly correlated (i.e. 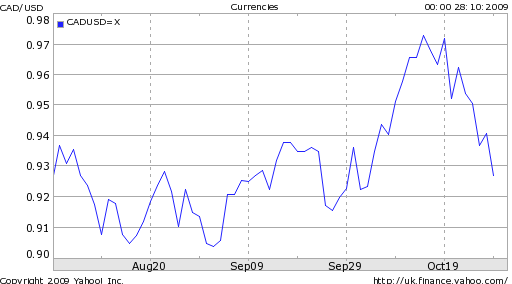 greater than 80 or less than -80 in the chart above) with almost every other major currency, relative to the US dollar. If the correlation was low, than it would imply that the Canadian dollar is fluctuating (in this case falling) for endemic reasons. In this case, however, the almost perfect correlation with the majors shows that it is almost definitely a US dollar spike rather than a Canadian dollar correction. Whether this trend continues then, depends more on the health of the US dollar and less on what investors think about the loonie. Sometimes I wonder if I’m living in the clouds. All of my recent reports on the Canadian dollar were twinged with pessimism, and I argued that it would only be a matter of time before reality caught up with theory. While the continued surge in commodities prices has confounded everyone’s expectations, other economic trends continue to work against Canada. In other words, I think that there is still a strong argument to be made for shorting the loonie. 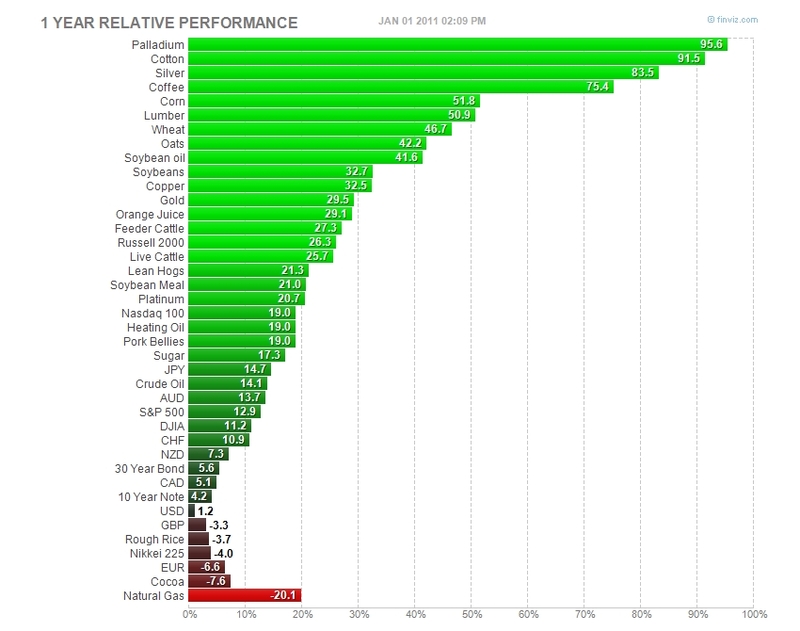 To be sure, the rally in commodities prices has been incredible- nearly 50% in less than a year! Oil prices are surging, gold prices just touched a record high, and a string of natural disasters have driven prices for agricultural staples to stratospheric levels. Given the perception of the Canadian dollar as a commodity currency, then, it’s no wonder that rising commodity prices have translated into a stronger currency. As I’ve argued previously, rising commodities prices are basically an irrelevant – or even distracting – factor when it comes to analyzing the loonie. That’s because, contrary to popular belief, commodities represent an almost negligible component of Canada’s economy. Canadian exports, of which commodities probably account for half, have recovered from the recession lows of 2009. On the other hand, the value of Canadian exports is basically the same as it was 10 years ago, when one US dollar could be exchanged for 1.5 Canadian dollars. Consider also that Canada now imports more than it exports, and that the Canadian balance of trade recently dipped into deficit for the first time since records started being kept 40 years ago. Its current account has similarly plunged, as Canadians have had to finance this through loans and investment capital from abroad. 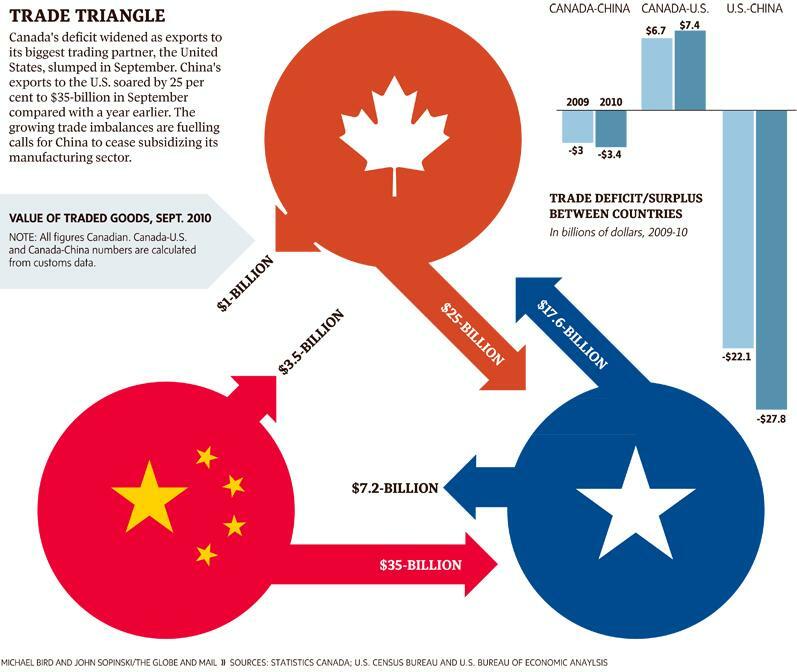 Based on the expenditure approach to GDP, trade actually detracts from Canadian GDP. Any way you perform the calculations, commodities are hardly the backbone of its economy, account for about 15% at most. As if that weren’t enough, the press is full of stories of Canadians that think their own currency is overvalued. Businesses complain that they can’t compete, and that banks won’t lend them the money they need to upgrade their facilities and become more efficient. Meanwhile consumers whine about higher prices in Canada, compared to the US. 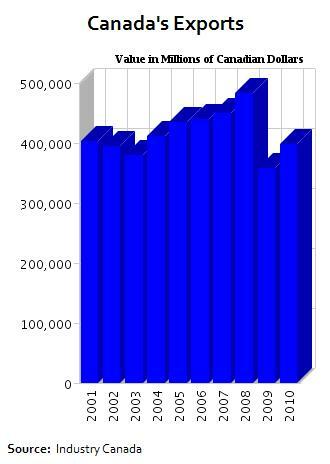 I think it’s very telling that there is now a 2-hour wait to cross the border from Vancouver, and shopping malls on the American side have reported a huge jump in business. Even the famous Big Mac Index shows that the price of a hamburger was already 12% higher in Canada back when the loonie was still hovering around parity with the US Dollar. One area that higher commodities prices will be felt is inflation, which is nearing a two-year high and rising. At 3.3%, Canada’s CPI rate is now higher than in the EU. Given that the European Central Bank hiked rates earlier this month, it probably won’t be long before the Bank of Canada follows suit. In fact, forecasters expect the benchmark rate to rise by 50-75 basis points by the end of the year, from the current 1%. This might excite carry traders, but probably few others. Besides, given that other central banks will probably raise rates concurrently, it can’t be assumed that carry traders will automatically gravitate towards the Canadian dollar. Not to mention that as I pointed out in my previous post, the carry trade is hardly a risk-free proposition. In this case, an interest rate differential of only 1-2% probably isn’t enough to compensate for the risk of a correction in the USD/CAD. And that is exactly what I expect will happen. The fact that the loonie has shattered even the most optimistic forecasts is not cause for bullishness, but rather for concern. According to the most recent Commitment of Traders report, net long positions are reaching extreme levels, and it’s probably only a matter of time before the loonie returns to earth. 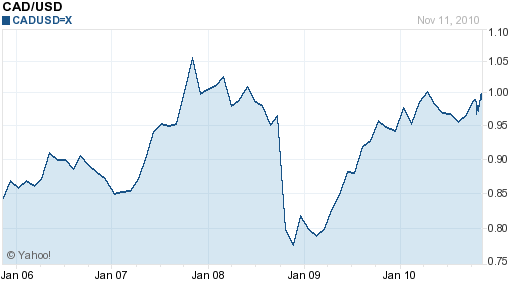 The Canadian Dollar (“Loonie”) recorded a fairly strong 2010. 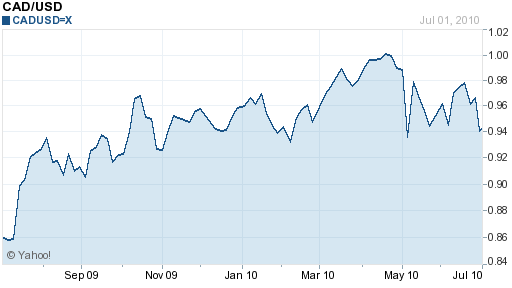 It appreciated 5.5% against the US Dollar, as an encore to a 16% gain in 2009. 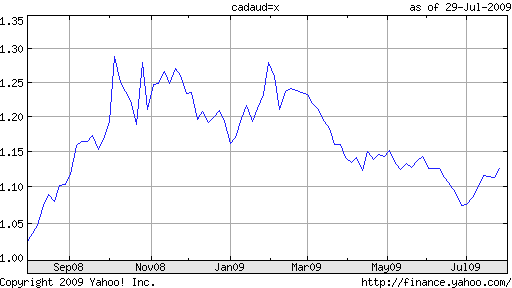 Moreover, its rise occurred with remarkably little volatility, fluctuating within a tight range of $0.99 – $1.08 (CAD/USD. It total, it rose against “seven of its major peers,” and “gained 4.4 percent over the past year in a measure of 10 developed-nation currencies, Bloomberg Correlation-Weighted Currency Indexes showed.” As for 2011, it is expected to continue trading close to 1:1 against the USD, though analysts differ over which side of parity it will tend towards. The second set of factors are macroeconomic. While slowing slightly in the second half of the year, the Canadian economy nonetheless exhibited a solid performance, which is expected to continue into 2011. Goldman Sachs, for example, “now sees growth accelerating to 3.3 per cent in the second quarter of this year, and 3.5 per cent in both the third and fourth quarters amid improving domestic demand.” However, the strong performance by natural resources and Canadian export strength that drove growth in 2010 could also be interpreted as a wild card in 2011, as the trade surplus narrows from a moderation in commodities prices and an expensive Canadian Dollar. Finally, there is the continuing search for “value currencies” that is driving investors towards the Loonie. According to Bill Gross, manager of the world’s biggest bond fund, “It’s a critical strategy going forward to get…into some currency that holds its value…I’d suggest Mexico, Brazil or Canada as three examples of countries with good fiscal balance sheets.” It doesn’t hurt that the Bank of Canada was the first G7 central bank to raise interest rates, and that its benchmark interest rate compares favorably with the US Dollar, Yen, etc. 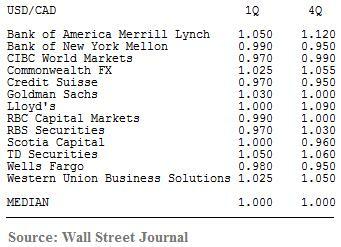 Moreover, it is forecast to hike rates by an additional 50 basis points in 2011, beginning in the third quarter. On the other hand, it will still be a couple years before rates are high enough to make carry trading viable. Besides, long-term interest rates are currently higher in the US, which means that investors hungry for yield will ultimately have to find other reasons for shifting funds to Canada. 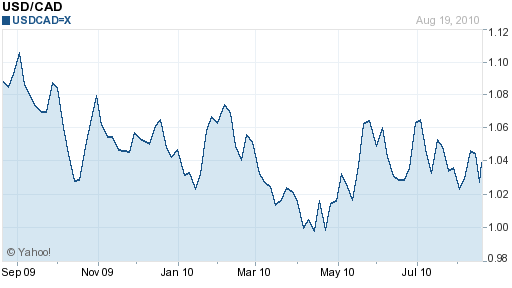 Forecasts for the Canadian Dollar in 2011 are extremely varied. If there’s any consensus, it is that barring any unforeseen developments, the Loonie will spend the year close to parity with the US Dollar. A couple analysts expect a big (downside) move, but the majority expects that regardless of which way the Loonie ultimately trends, it probably won’t be far removed from current levels. “The Bloomberg composite of 32 forecasts has the loonie spending most of the year at parity, then dipping slightly by the fourth quarter.” A similar WSJ survey shows a median forecast of 1:1 throughout the entire year. Some analysts expect more movement in the currency crosses (i.e. against currencies besides the US Dollar). Given that the Canadian Dollar accounts for such a small portion of overall forex trading volume, however, it seems more likely that CAD cross rates will take their cues entirely from the USD and the rule of triangular arbitrage. 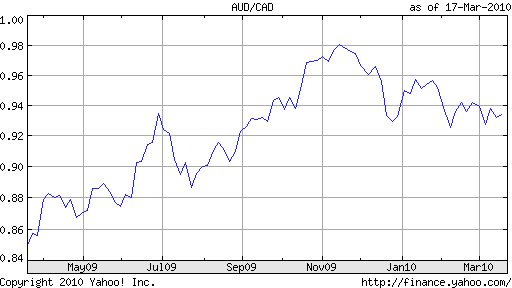 (For example, if the Dollar rises against the Loonie but falls against the Aussie in 2011, the Loonie will necessarily also fall against the Aussie, regardless of whether fundamentals dictate such a movie). I’m personally inclined to agree with the majority. There are many good reasons to buy the Loonie, but most of these were already priced in during the Loonie’s steady climb over the last two years. Going forward, I think that the US economy represents a double-edged sword that will prevent the Loonie from rising further. In short, if the US economy falters, so will the Canadian economy. If the US economic recovery gathers momentum, however, there will be good reason to buy the US Dollar in lieu of its counterpart to the north. After a stellar 2009, the Canadian Dollar (“Loonie”) has had a relatively lackluster 2010 against the Dollar, rising by only 3-4%. As the Loonie has inched (back) towards parity, it has encountered significant resistance. I think there is reason to believe that the currency has reached its limit, and that there are little prospects for further appreciation for at least the first half of 2011. Everyone likes to think of the Canadian Dollar as a commodity currency, but I don’t think this is an accurate representation. Net energy exports account for only a small portion (2.9%) of Canadian GDP, a fraction which is dwarfed by the export of automobiles, for example. In fact, eastern Canada, which is comparatively poor in natural resources, is actually a net energy importer. I think that investors have largely come to the same conclusion, and significant rallies in oil and other commodity prices in the second half of 2010 spurred only a modest appreciation in the Loonie. The currency has risen so fast over the last couple years that Canada has run a trade deficit for six consecutive months, including a record $2.5 Billion in July. (In some ways, doesn’t this prove that economic imbalances will ultimately self-correct?!). In addition, to say that Canadian export sector is heavily reliant on the US would be an understatement: “The U.S. bought 70 percent of Canada’s exports in October, down from 75 percent in June, and a record of about 85 percent in 2001.” It’s no wonder that Canadian economic officials have defended the Fed’s QE2 monetary easing program; they know that Canada’s economic health is contingent on a strong US economy. As for how fluctuations in risk affect the Loonie, it’s not clear. On two separate occasions, the WSJ reported first that “With investors more willing to take on riskier assets than they were the day before, the Canadian dollar was able to move sharply higher,” and then that “Canada’s relatively strong fiscal and economic fundamentals attract safe-haven flows when investors are fleeing from risk.” What a blatant contradiction if there ever was one! Personally, I think that Canada’s economic structure and relatively high debt levels disqualify the Loonie from consideration as a safe-haven currency. That being said, it has notched some impressive gains against other non-safe haven currencies. If not for its low interest rates, nobody would even mention it in the same breath as the US Dollar or Japanese Yen. 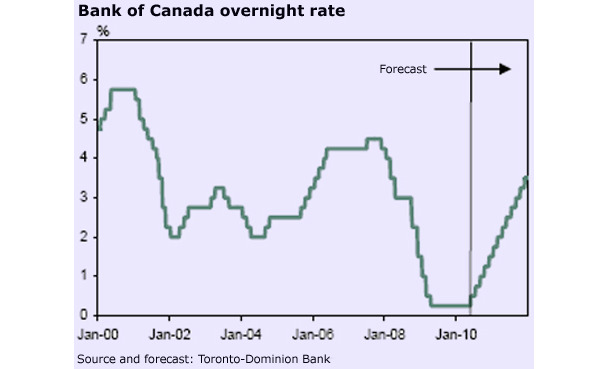 Speaking of low rates, the Bank of Canada voted last week to keep its benchmark interest rate on hold at 1% and indicated that it won’t consider raising them for quite some time. Said Central Bank Governor Mark Carney, “There are limits to the divergence that there can be between Canada and the United States.” In other words, the BOC probably won’t hike rates until the Fed does, at which point there will be very little basis for buying the Loonie over the US Dollar. It’s a bad sign for the Loonie when even Canadians think it’s overvalued. 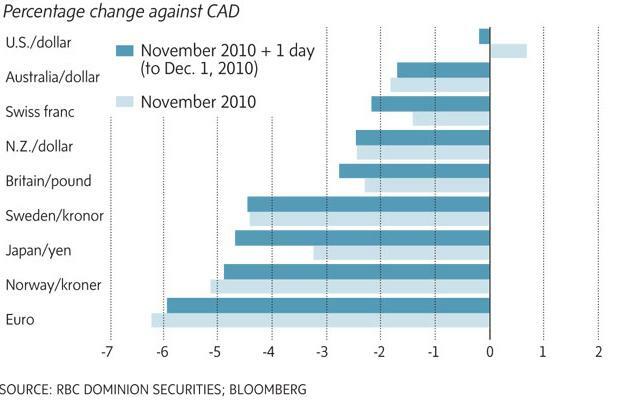 The Canadian Dollar was supposed to be one of the “hot” currencies of 2010. Given that it’s now exactly where it started the year, I think it’s safe to say that this isn’t the case. On the one hand, it would seem that the markets are still confused about how much the CAD should be worth, as Adam recently pointed out. An alternative interpretation is that investors believe the Loonie should trade near parity with the US Dollar; it has hovered just above that mark since breaching it in April. 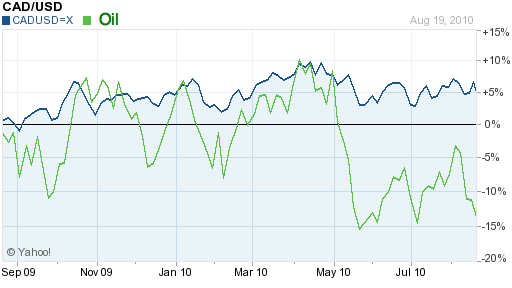 The Canadian Dollar has benefited from strong fundamentals, especially compared to the US. Inflation is low and the economy is stable. “The International Monetary Fund (IMF) recently said that Canada is likely to be the first of the seven major industrialized democracies to return to a budgetary surplus status by 2015.” 2010 GDP growth is projected at 3.3%, compared to around 2.5% in the US. For this reason, “Pacific Investment Management Co. founder Bill Gross said he favors Canada…he’s ‘in awe’ of countries such as Canada that have a low debt-to-gross-domestic- product ratio and solvent financial institutions. ‘North of the border’ has become a ‘preferable destination’ to what he sees in the U.S.” As a result, analysts have started to look beyond commodities, historically seen as the cornerstone of Canada’s economy. When the price of oil collapsed in May, the Loonie hardly budged. Given that Canada’s balance of trade is negative in spite of its commodity exports, maybe in focus is justified. 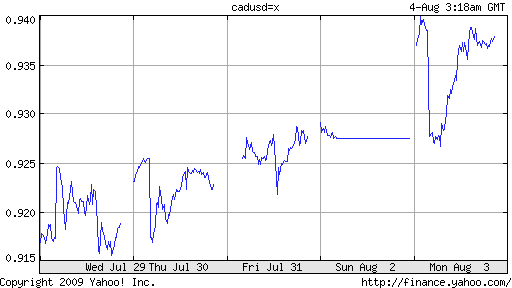 Throughout the rest of the summer, the Loonie will likely remain rangebound. Most traders are on vacation and trading volume is low. Besides, risk appetite is currently weak. When the markets return to full swing in September, I expect the Loonie will experience in a surge in volatility. In fact, investors are already starting to adjust their positions, with the most recent Commitment of Traders report showing an increase in Net Longs, bringing the total to $4.2 Billion. There is certainly a basis for predicting continued strength, but I think much depends on how commodity prices perform. 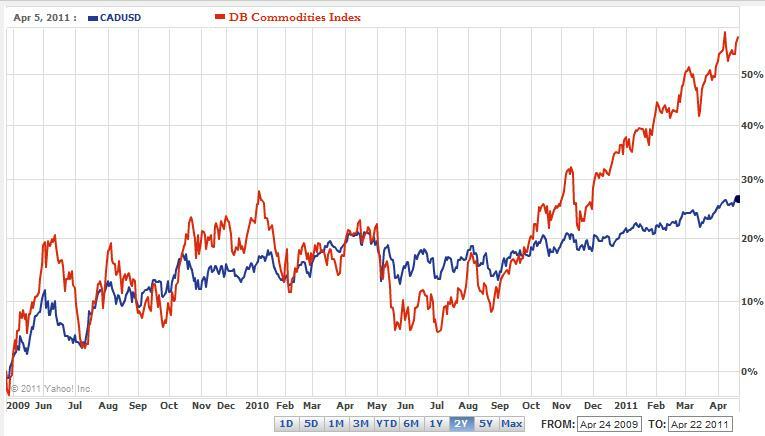 As I pointed out above, the Loonie remains somewhat decoupled from commodities. That it nonetheless got a boost from strong wheat prices and the $40 Billion takeover bid for Potash Corp by mining giant BHP Biliton shows that investors still view Canada as a resource economy. If the global economy avoids a double-dip recession, commodities prices will probably recover and the Loonie will probably rise slowly towards parity. On the flip-side, the Loonie would be one of the big losers of a global slide back into recession. 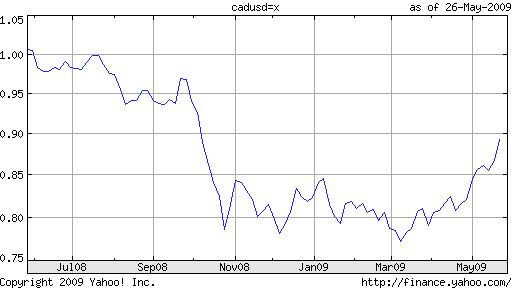 The Canadian Dollar fell from parity with the US Dollar in July 2008. For a minute, it looked as though it would return to that mark in October 2009. Alas, it was not to be, as the currency that had risen 20% since March wasn’t able to rise another 3% to close the elusive gap that would once again bring it face-to-face with the Greenback. 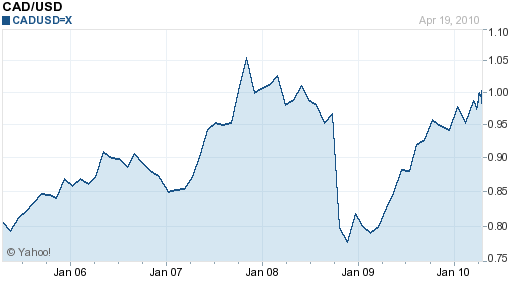 The Loonie’s rise was not difficult to understand. Soaring commodity prices and the fact that the economic recession was milder in Canada than in other economies drove the perception that Canada was a good place to invest. Despite a surging budget deficit and weak domestic consumption, investors bought into this notion. The weak Dollar and rising risk aversion reinforced this perception, and as investors accepted that parity was inevitable, hot money poured in and the Loonie’s rise became self-fulfilling. Intervention is supported both by economic data, and other Canadian institutions. According to one estimate, every 1 cent increase in the Loonie against the Greenback costs the county $2 Billion in export revenue and 25,000 jobs. The chief economist for CIBC, meanwhile, has warned that many companies are in the process of making long-term direct investment decisions, and could be discouraged from locating in Canada because of perceptions that its currency will remain strong for the immediate future: “If the loonie is overvalued for a few years, we may be sacrificing business plant and equipment on the altar of a strong currency.” He also compared the predicament facing the Bank of Canada to that facing the Royal Bank of Switzerland, which ultimately and successfully intervened on behalf of the Franc. Intervention on behalf of the Loonie, he argued, could be undertaken under the umbrella of fighting speculation and irrational movements in currency markets. Prior to this outburst, investors had basically concluded that the BOC wasn’t prepared to put its money where its mouth was, so to speak. “The central bank’s shot across the bow has definitely subsided. There’s not much they can do,” summarized one analyst a few weeks ago. The term “jawboning” had become the preference of columnists and investors when discussing the resolve of the BOC. The belief was that the BOC had concluded that intervention was essentially a futile proposition (based on its failed efforts in the late 1990’s), and that it would instead resort to making idle threats. In fact, it seems investors still are no convinced that the BOC (via Carney) means what it says. “Mark Carney has raised the prospect of intervening in currency markets, but seems reluctant to actually do so,” argued one analyst. “I don’t think they would really like to intervene at all, and they would prefer avoiding it. If they can intervene by jaw boning, they would much rather do that,” added another. Why did the Loonie fall suddenly then, if the markets still aren’t concerned about intervention? The answer is that they have seen the concrete impact of the expensive Loonie on the Canadian economy. In the words of one analyst, it has moved from being a threat to a bona fide impediment. 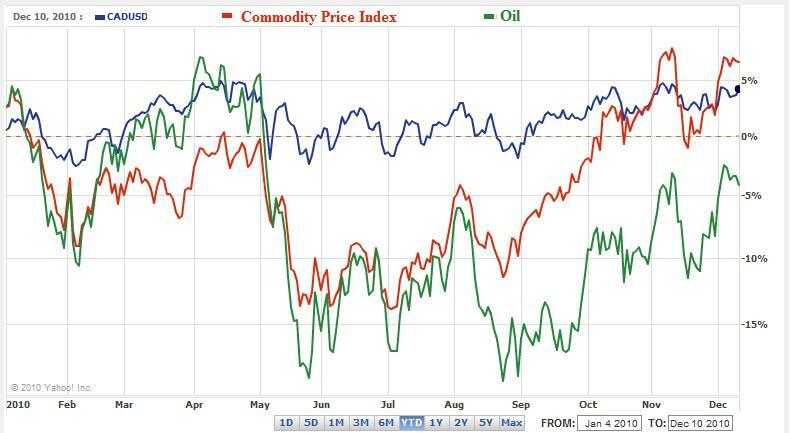 Especially given the stall in the commodity price rally, investors apparently are willing to acknowledge that they may have gotten ahead of themselves and that parity with the Dollar is not yet justified by fundamentals. Meanwhile, Canadian interest rates are at a comparable level with US rates, which means foreign investors can’t earn a yield spread from investing in Canada. This is likely to be the case for a while, as the valuable Loonie has kept inflation in check and given the BOC some flexibility in tightening its monetary policy. Personally, I don’t think the BOC will ultimately intervene. Investors have shown that they aren’t afraid of the BOC, which would make any intervention both expensive and unfruitful. In addition, I think investors have accepted their own accesses, and will hesitate to push the Loonie much higher (or past parity, for that matter) until there is more evidence that such is justified. In the meantime, expect the Loonie to hover in the 90’s and perhaps even test parity, before smashing through when the time is right. And this, I do believe, is inevitable. Despite an ebb in risk aversion, the Canadian Dollar is once again falling. Since touching a high of $1.18 in January, the Loonie has zigzagged its way downwards and hovered around $1.25. March 31 marked the end of its third straight quarterly decline. With the exception of the Japanese Yen (which is declining due to economic factors), virtually every currency has risen against the US Dollar in recent weeks. Stock market rallies have been accompanied by a general pickup in risk tolerance, and investors are piling back into assets and currencies that had been abandoned during the worst of the credit crisis. Why, then, has the Canadian Dollar been excluded from this rally? Investors cannot be faulted for focusing on the abysmal Canadian economic situation. Employment, public and private spending, and construction – to cite a few indicators – are all falling at alarming speed. As a result, “the nation’s economy, the world’s eighth largest, will shrink at an 8.5 percent annualized pace in the first quarter, the largest decline since at least 1961.” Given that the picture is equally grim throughout the world, however, there must be another explanation. Cue Mark Carney, head of Canada’s Central Bank, who has announced that Canada will “adopt a much milder version of the U.S. and U.K. strategy of printing more money to fight the recession.” Euphemistically referred to as “quantitative easing,” such a policy involves the injection of cash directly into credit markets and government bond markets, with the dual purpose of creating liquidity and stimulating the economy. The concern, especially among forex traders, is that printing money will lead to inflation further down the road. When similar policies were announced by the Central Banks of the US, UK, and Switzerland, for example, their currencies plummeted instantly. In the words of one trader, “The precedent is a haircut right off the currency.” The Central Bank of Canada does have a reputation for being conservative, which suggests that it is likely to pursue quantitative easing only as a last step, and in a measured dose. Accordingly, there is still some bullish sentiment surrounding the Canadian Dollar. 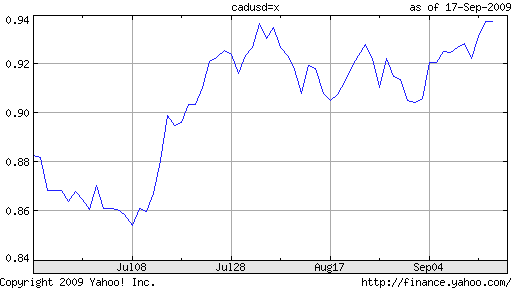 One analyst even urges readers to “Consider the Canadian Dollar as a Possible Inflation Hedge,” partly on the basis that “The Loonie is a commodity based currency, so stronger commodity prices mean a stronger Loonie.” Given that crude oil and base metals prices are extremely correlated with the Loonie, this is a fair point. “Canada’s currency will fall 3.3 percent to C$1.27 to the U.S. dollar by July, from C$1.2298 on April 3, according to the median forecast in a Bloomberg News survey of 40 economists and analysts.” Whether this prediction actually obtains depends primarily on what, if anything, Mark Carney and his colleagues at the Central Bank of Canada decide at their next meeting, scheduled for April 23. The loonie, as the currency is known because of the image of the bird on the one-dollar coin, has traded near parity with its U.S. counterpart this year after climbing 17 percent in 2007. "The breakdown is still quiet tentative but it’s weakened in the last few sessions. For Canada in particular there isn’t one story in the market. We have several different stories going on at the same time." Last week, the Bank of Canada cut interest rates by 25 basis points, bringing its benchmark lending rate down to 4%. Fortunately for the Canadian Dollar, the rate cut paled in comparison to the 75 basis point move effected by America’s Federal Reserve Bank. While the Bank of Canada offered a hackneyed rationale of "keeping aggregate supply and demand in balance" for the change in monetary policy, there is still some surrounding haze since Canadian inflation is rising and economic growth is strong. The currency had slipped below parity against its American counterpart, but is now slowly crawling its way back. If commodity prices remain high, the currency will likely push back across that psychologically important barrier of 1:1 with the USD. The weakness of the American dollar worries some Canadian investors as well as businesses that rely on American customers. ‘Canadian bank traders see little in the BoC minutes to suggest that future rate hikes are in the works, after today’s ‘no change’ decision,’ said Peter Wadkins at Thomson IFR Markets. “The time to buy the Canadian dollar is nearing.” The currency will gain strength from a fast-recovering U.S. economy and the lack of a benchmark interest rate cut from the Bank of Canada in 2007, Citigroup predicted. 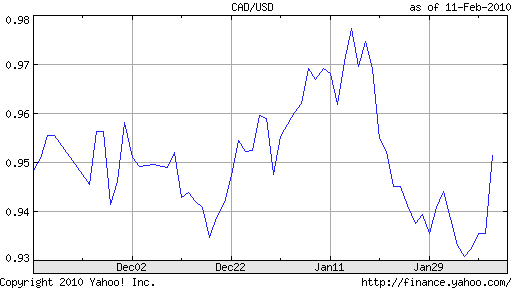 Canadian Dollar to remain range-bound? 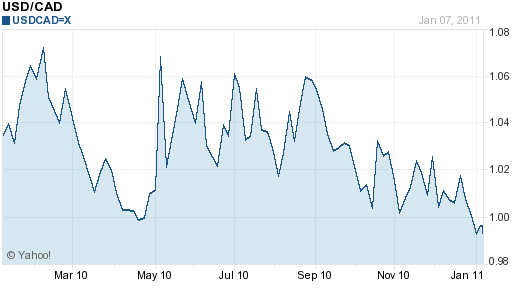 Volatility is never far away from the currency markets. Canada could see elections in Ottawa and in some provinces within a year, and the outlook for the U.S. economy remains uncertain. Canada currently had enough oil reserves to supply all US oil needs for the next three years. The only problem is that much of this oil is trapped in Canada’s oil sands, and it may be costly and difficult to extract. Once the oil starts to flow, however, Canada will likely become one of the world’s top 10 oil exporters, behind such powerhouses as Venezuela, Russia, Saudi Arabia, and Iran. The recent strength of Canada’s currency, the Loonie, can be almost entirely attributed to the high price of commodities, especially oil. It seems forex traders would benefit from studying a little geology. Canada, which buys more U.S. goods than any other country, suggested it will keep out of currency markets for another five years and warned other nations to follow suit or face a global slowdown from trade imbalances. The central bank has raised its trend-setting overnight interest rate three times in recent months, to 3.25 per cent, to keep inflation from taking off. Analysts have said the bank could push the key rate as high as four per cent in 2006. Yields on interest-rate futures indicate traders expect the central bank will raise its benchmark rate a quarter percentage point…on Dec. 6 and Jan. 24. The yield on the March futures contract was 3.86 percent, about the highest this year.